Sports in all its forms, from Major League Baseball to Fantasy Football is driven by and produces huge amounts of data, and advanced data mining and machine learning techniques are now having a major impact on sports data analytics. A fascinating collection of research and perspective articles on the design, development, and evaluation of methods and their use in sports analytics, both on the business side and in game strategy is published in a special issue of Big Data. 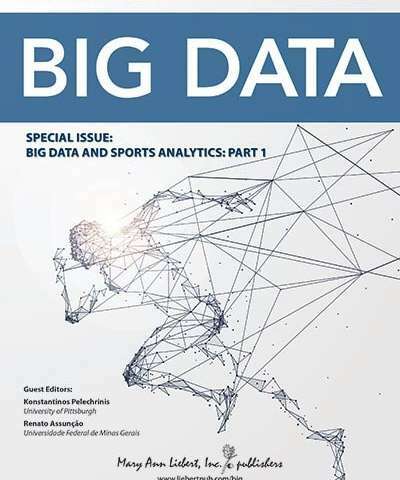 Entitled "Big Data in Sports Analytics ," the special issue was led by co-Guest Editors Renato Assunção, Ph.D., Universidade Federal de Minas Gerais (Brazil), and Konstantinos Pelechrinis, Ph.D., University of Pittsburgh (PA). Featured in the special issue is the article "Effects of Pacing Properties on Performance in Long-Distance Running ," coauthored by Arie-Willem de Leeuw, Laurentius Meerhoff, and Arno Knobbe, Leiden University (The Netherlands). The researchers used publicly available data on more than 120,000 runners participating in official races, focusing on their pacing strategy or how fast they run at various stages of the race and how that can affect their overall performance. The authors describe their data mining method, which produces simple patterns that can benefit both professional and amateur runners. Andrew Urbaczewski and Ryan Elmore, University of Denver (Colorado), contributed an article entitled "Big Data, Efficient Markets, and the End of Daily Fantasy Sports As We Know It?." The researchers propose that the availability of big data, today's computer power, and efficient market hypothesis will change the relatively new phenomenon of daily fantasy sports dramatically. They discuss the effects of applying similar technologies to other markets as a comparison to understand what could lie ahead for daily fantasy sports. "Big data and artificial intelligence are changing the world of sports. Professional teams and other stakeholders are increasingly hiring machine learning experts to help optimize not only marketing, ticket sales, and fan engagement but also draft selection, player evaluation, and game-day decision making," says Big Data Editor-in-Chief Zoran Obradovic, Ph.D., Carnell Professor of Data Analytics, Temple University, Philadelphia, PA. "State-of-the-art solutions for a range of important challenges in the emerging area of sports analytics are discussed in this special issue which will be enjoyed by big data and sports enthusiasts."